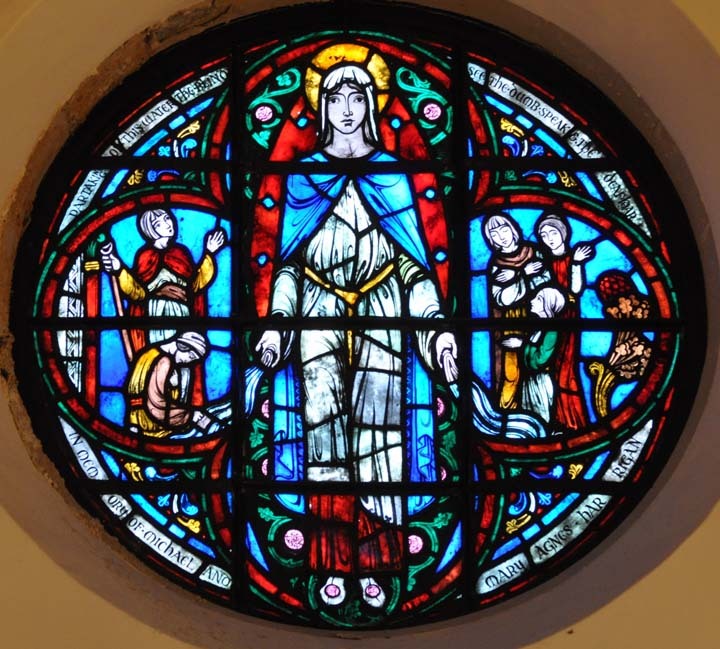 Brief Description of Subject: This is part of a series of 4 roundels located in the nave that depict the Virgin Mary. The sketch for this series by Wright Goodhue currently resides at the Rakow Research Library --- part of the Corning Glass Museum. In a grotto near Lourdes, over a period of three weeks in 1858, Bernadette Soubirous had 17 visions of a woman dressed in white. In the last vision the woman identified herself as "The Immaculate Conception". The water in the grotto has been associated with many miracles of healing and is a major pilgrimage site. In the right cusp of the quatrefoil is a depiction of the first vision at Lourdes. Bernadette with her sisters Toinette and Jeane Abadie were out collecting firewood when Bernadette, wading into a small stream, heard a wind that only moved a rose in the grotto and saw a woman dressed in white. Her sisters were worried when they saw Bernadette in ecstasy. Mary, dressed in white, is seen with roses at her feet and head. In the left cusp, I believe are pilgrims that have come to partake of the healing waters in the grotto.